The HP 12C Platinum is a powerful tool capable of handling the most complex and detailed financial calculations. 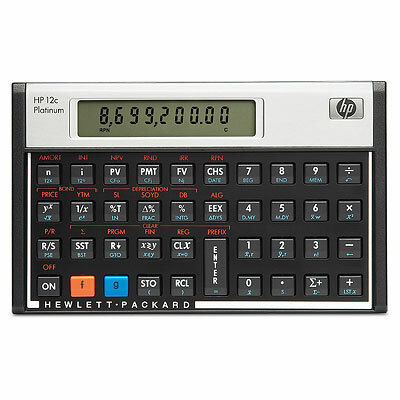 Users of the HP 12c Platinum will enjoy the flexibility this calculator offers with both RPN and algebraic modes of entry, the increased memory capacity and the more-than 130 built-in functions. Easily calculate loan payments, interest rates and conversions, standard deviation, percent, TVM, NPV, IRR, cash flows, bonds and more. Ideal for real estate, finance, accounting, economics and business work. Permitted for use on the CFP® and CFA® Certification Exams, and GARP® FRM Exam.